Facing the busy Las Vegas Strip is the Forum Shops at Caesars Palace, a 664,000-square-foot shopping mall. 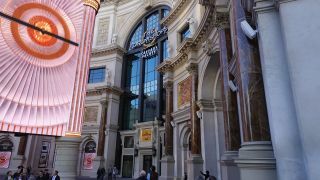 Busy with pedestrian, shoppers, and those staying at the opulent Caesars Palace, it is a main stay of the Strip. The Forum Shops’ entrance recently underwent an AV upgrade involving a vertical marquee, a complement of digital visuals evoking ancient Rome, and a large-scale distributed audio system employing over two dozen loudspeakers from Bose Professional, including modules from the Bose Panaray and FreeSpace lines. These upgrades were initiated by property owner Simon, which is known for luxury shopping malls. Moment Factory, with support from Acquire Digital, created and implements new graphics, visual design, and content. But after the installation of these visual elements, all agreed something was missing. Moment Factory subsequently worked with Mood Media and Bose Professional to design, spec, and install the robust audio system. The system includes 16 Bose Panaray 402 Series IV loudspeakers in white, four additional Panaray 402 Series IV loudspeakers in black, four MB12 WR weather-resistant modular bass loudspeakers, and several FreeSpace 360P Series II full-range environmental loudspeakers. Power is handled by four Bose PowerMatch PM8500N configurable amplifiers, and processing is handled by a Bose ControlSpace ESP-880 engineered sound processor with Ethernet, and a Bose ControlSpace CC-64 control center. The white Panaray 402s are arranged on the building’s façade, and the black 402s are placed at the bottom of the marquee. The MB12 subwoofers—not visible to the public— are inside the marquee, and they project the bass frequencies down and out through the bottom of the marquee. The FreeSpace 360P environmental loudspeakers are installed in the landscape beds along the sidewalk between the show area and Las Vegas Blvd. Throughout the course of the project, Mood worked closely with Bose Professional personnel to ensure that the audio system would meet the goals that Simon had outlined and that it would complement the graphics created by Moment Factory. "Our new marquee has had a very positive impact for The Forum Shops at Caesars Palace – it has elevated our presence on Las Vegas Blvd in grand style,” added Chip Harding, senior vice president of business development at Simon. “The marquee's unique design has changed the digital signage landscape in Las Vegas. We have definitely raised the bar in a market that is notorious for audio and visual stimulation."